YateHSS/HLR delivers failover cluster, load-balancing and scalability features inside a cluster at an affordable price, breaking the barriers to entry the market for MVNOs and IoT products manufacturers, leading to a positive ROI from an early stage of the business. The YateHSS/HLR was designed to be flexible over time, safe for the mobile operators and IoT businesses and with low CapEx and OpEx requirements. It’s flexible over time because YateHSS/HLR uses off-the-shelf hardware (Dell servers) and runs on Linux OS; in time you can upgrade the software or change the hardware at a low OpEx. It’s safe because our network database solution is organized into clusters of equal YateHSS/HLR servers, load-balanced, easy to scale and redundant. We practice transparency for the price of our products, see for yourself. At this price, the YateHSS/HLR solution significantly lowers the barriers to entry a new market and the CapEx of the business. The cluster solution includes the YateMMI management web-interface, a JSON API for configuration and setting up services and SIM profiles, and an HTTP hook to access your own web tools or platforms. YateHSS/HLR supports the following profiles: Wi-Fi, EPC, IMS, CS, PS. We created the solution to be affordable and to have all the features for network stability. One server supports approximately 100.000 subscribers. For small networks, the investment is as low as $1/ subscriber and for large networks of less than $0.50/ subscriber. Stability comes from the cluster’s load-balancing feature. Subscribers’ services are distributed between the nodes in the cluster and millions of operations can take place at the same time without the risk of capacity failure. Stability also derives from a failover cluster feature implemented in the YateHSS/HLR solution. The network services take place in a single node (one YateHSS/HLR server) of the cluster, but each node replicates the events to the other nodes. All nodes have the same replicated information and if a node breaks, another one takes its load automatically. Our solution’s flexibility comes with a big advantage: the simplicity of scaling up in case your network grows. Adding a new node to the cluster is a process that takes less than one hour. There isn’t any maximum limit of how many HSS/HLRs clusters to deploy in a network. If you need to understand the technical details behind the cluster, please take a closer look to our documentation regarding the YateHSS/HLR cluster architecture. Think about the project that is technically and financially sustainable with YateHSS/HLR. The YateHSS/HLR solution allows millions of IoT devices to connect and makes a wide variety of applications possible for final users. We recommend the YateHSS/HLR as an excellent choice for MVNOs and IoT manufacturers entering a market, for its features and for the return on investment advantage in terms of business. Stepping into 2016, we have exciting news. Through 2015 we continued to develop the GSM/GPRS SatSite base station, as well as our main core network products: the ​2G/2.5G/4G YateUCN core network and the ​2G/3G/4G YateHSS/HLR. We start 2016 with the release of the LTE SatSite Model 142, with software-selectable LTE or GSM/GPRS operation, generating 10-20 Watts LTE power output with a power consumption of only 65-80 Watts. We also prepared new features and updates for YateHSS/HLR after receiving relevant feedback from our customers. And there is the new YateBTS website, which now offers extensive information on our products, solutions and our technology. The LTE SatSite Model 142 delivers software-selectable LTE or GSM/GPRS operation from the same base station. 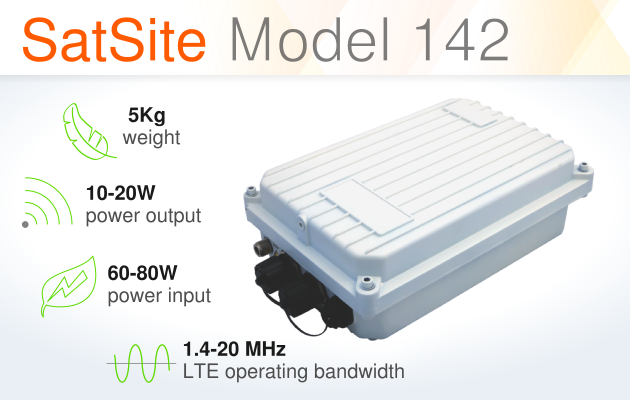 In both LTE and GSM/GPRS modes, the SatSite Model 142 generates a higher output power than the previous model. As an eNodeB, the SatSite operates at up to 20 Watts, at bandwidths of 1.4 to 20 MHz, while in GSM/GPRS mode the SatSite operates at up to 20 Watts for 1-TRX or 2 Watts/TRX in multi-TRX configuration (at up to 4-TRX). The SatSite weighs only 5kg and has a low enough power consumption that it can be easily powered by solar panels in most of the world. Its required backhaul is under 100 Mbit, resulting from the fact that, unlike many LTE solutions, the SatSite is a unified LTE eNodeB, and not a remote radio head (RRH) that needs a separate baseband unit (BBU). For more information about Model 142’s complete specifications, please check the ​datasheet. On the core network side, we start 2016 with new features to the YateHSS/HLR: scalability (cluster configuration), multi-IMSI support and support for separate circuit-switched/packet-switched network profiles. Cluster configuration allows YateHSS/HLR nodes to work in a cloud to provide scalability. YateHSS/HLR servers all provide the same service and handle the same subscribers. If a server fails, the subscribers are distributed to the other YateHSS/HLR nodes in the cluster, which continues to provide the same services. Multi-IMSI support allows YateHSS/HLR to respond to an alternative IMSI from the same SIM card, in different roaming scenarios. The feature sends an HTTP request to the operator’s server after the subscriber tries to roam into a new network. The operator’s server uses the request to trigger an IMSI change in the SIM using an OTA mechanism. The SIM carries a multi-IMSI application that ensures that the SIM will return to the main IMSI if it cannot register with the alternative IMSI. The support for separate CS/PS profiles means that subscribers’ profiles are grouped according to the types of services associated to them, allowing the profiles to be easily updated to provide new services. For example, a subscriber might have “Prepaid voice, roaming”, “Prepaid data 1Mbps, not roaming” and “LTE not allowed” settings. It is easy to change one service of a subscriber by simply selecting another profile. We have entered 2016 with great new core network features and new RAN product releases, making new opportunities for operators. Follow us on Twitter, LinkedIn, YouTube and Facebook to find out first about our new announcements and releases. The YateUCN is an LTE EPC that unifies all the functions of a conventional LTE core network into a single server. A single YateUCN unit combines the MME, SGW, PGW, PCEF and PCRF functions. A pool of YateUCN servers provide seamless horizontal redundancy, scalability and load balancing in the LTE core network. The ​YateUCN also replaces the latest core network approaches to design and management, such as network function virtualization (NFV) that virtualizes the functions of the network’s nodes in software or software-defined networking (SDN) that splits the control plane from the user plane. A conventional LTE core network has many components and each requires a back-up node for redundancy. To ensure load balancing, operators need to deploy load balancers and external servers, which only add to the complexity count. The YateUCN servers that form the EPC cloud have a many-to-many relationship with the eNodeBs, are equal at application lever, and eliminate the single point of failure between the RAN and the core network. All these characteristics allow for horizontal redundancy, load balancing, easy management and an overall simplicity within the network. In conventional LTE networks, all core network components (MME, SGW, PGW, PCEF, PCRF) need to be duplicated to ensure redundancy and synchronization in case of failure. With a YateUCN-based core network, operators add extra servers to the existing pool to increase the network’s overall capacity. To achieve redundancy, subscribers get assigned to random servers from the YateUCN pool. If a YateUCN fails, all the devices served by that unit are automatically re-assigned to other available YateUCN servers, as seen in the diagram. A cluster of YateUCN servers act as an LTE core network cloud, providing all the EPC services: mobility, authentication, quality of service, routing upload and download IP packets, IP address allocation and more. Mobile operators eliminate the occurrence of a single point of failure between the RAN and the core network because YateUCN servers are equal at application level, and have a many-to-many relationship with the eNodeBs. By removing the single point of failure possibility, mobile carriers can build scalable and considerably leaner core networks, while also providing load balancing for enhanced flexibility. Each YateUCN core network server is implemented in off-the-shelf servers commodity software (Linux), offering a shorter lead time, more servicing options and faster replacement time. 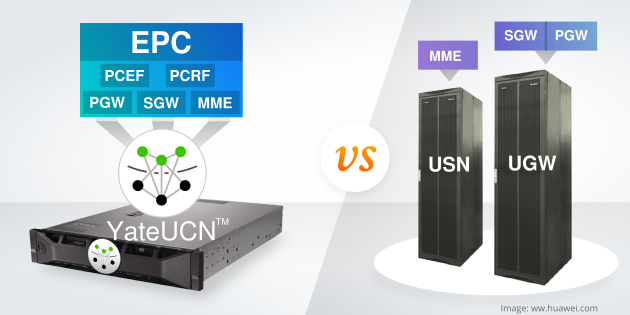 The entire LTE EPC layer is implemented in a single YateUCN unit, meaning that it replaces the MME, the SGW, the PGW, the PCEF and the PCRF units of conventional networks. The YateUCN is compatible with any generic LTE RAN and core network component. It supports the S1-AP and GTP interfaces between its MME and SGW functions and the eNodeBs. The YateUCN uses Diameter (S6a) to connect to an existing generic Home Subscriber Server (HSS). The unified server can connect to external PGW and SGW via the S5/S8 interface. To link to an existing IMS, to the Internet or to an MMS service, the YateUCN uses the SGi interface. Finally, to interrogate an external Equipment Identity Register (EIR) about blacklisted IMEIs, the YateUCN uses S13 over Diameter. Additionally, the YateUCN also implements the IMS functions necessary for deploying VoLTE, but this will be detailed in a future article. In the meantime, previous blog posts have detailed the YateUCN’s ​VoLTE call with an iPhone 6 or how the YateUCN handles ​SRVCC. A unified core network server that delivers redundancy, scalability, load balancing and flexibility allows mobile operators to tap new core network equipment innovations and reduce their CAPEX. Easily integrated in an existing LTE network, the YateUCN makes it possible for mobile carriers to optimize their networks and replace solutions typically characteristic to the recent mobile LTE deployments, such as NFV or SDN. Traditionally, the redundancy of the Mobile Switching Center / Visitor Location Register (MSC/VLR) is obtained through redundant dedicated hardware and software. The problem lies in the Abis + A interfaces (BSSAP protocol) which do not allow a base station to move easily to another MSC/VLR. To overcome this problem, we decided to use the SIP protocol (with enhanced features for GSM operations), which allows a YateBTS SatSite base station to move to another YateUCN (MSC/VLR) automatically and quickly. In a GSM network deployed with YateBTS-based SatSite base stations and YateUCN core network servers, each subscriber is randomly assigned to a YateUCN from a pool of core network servers. Operators can increase the redundancy of the pool by simply adding additional YateUCN servers for excess capacity in case a unit malfunctions. Therefore, handsets connected to a single SatSite can be served by multiple identical YateUCNs, while, at the same time, a single YateUCN serves multiple SatSite units. If a YateUCN server fails, all the mobile devices served by it are automatically moved to the other available YateUCN servers. When the subscriber is registered to the new YateUCN, its location is updated in the HLR. In short, YateUCN and the GSM YateBTS SatSite base stations form a many-to-many relationship, and this was made possible though a number of characteristics. The GSM YateBTS SatSite implements all the functions of a conventional Base Station Controller (BSC). The A interface (between the BSC and the MSC/VLR) was replaced with SIP (between YateBTS and YateUCN), making it possible to quickly re-associate handsets with different YateUCN servers. All YateUCN servers are identical units that support many core network functions. Operators will only have to duplicate one component, as opposed to multiple in conventional networks. YateUCN is implemented in commodity hardware (off-the-shelf servers) and software (Linux), delivering a shorter lead time, more servicing options and faster replacement time. The diagram below illustrates the technology perfectly. The SatSite and the YateUCN components are easy to integrate into existing LTE networks because 2G services are delivered in SIP. These GSM services are integrated into a 4G network by employing the same GTP and IMS interfaces that are typically used in conventional EPC/IMS core networks. YateUCN implements the same SIP switch to both provide GSM services and connect to an existing IMS network. Thus, with both the SIP-powered RAN and core network products, operators’ migration from GSM to LTE turns into a much simpler process. As an MSC/VLR, YateUCN performs all the functions of other MSC/VLRs: mobility, authentication, speech call and SMS routing. The server supports authentication of handsets using the SIM/USIM (EAP-SIM/EAP-AKA) and SIP AKAv1-MD5 algorithms. 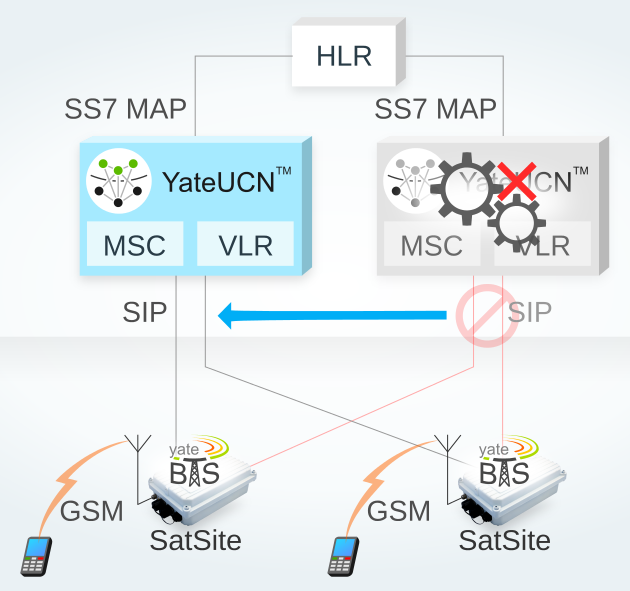 YateUCN can connect to any standard HLR via the SS7 MAP protocol, and to other MSCs and GMSCs through the MAP-E protocol, allowing it to be in any conventional GSM network. YateUCN brings something new to GSM equipment: affordable redundancy, scalability, and uncomplicated management into a single core network server. It is easy to integrate to existing GSM and LTE networks and can be easily upgraded with new features within the same hardware and allows operators a seamless network extension.